historical and contemporary paradigms now structuring and influencing qualitative research in the human disciplines. The chapters move from competing paradigms (positivist, post positivist, constructivist, critical theory) to specific interpretive perspectives, feminisms, racialized discourses, cultural studies, sexualities, and queer theory. 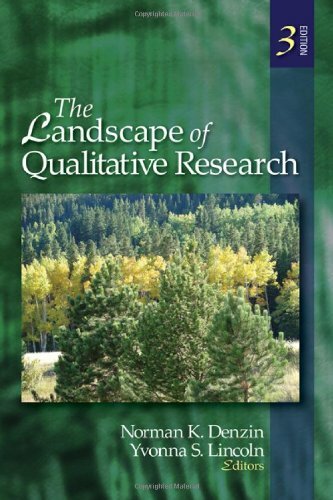 Part III considers the future of qualitative research. New to the Third Edition - Contains a new Reader's Guide prepared by the editors that helps students and researchers navigate through the chapters, locating the different methodologies, methods, techniques, issues, and theories relevant to their work. - Presents an abbreviated Glossary of terms that offer students and researchers a ready resource to help decode the language of qualitative research. - Offers recommended Readings that provide readers with additional sources on specific topic areas linked to their research. Intended Audience This text is designed for graduate students taking classes in social research methods and qualitative methods as well as researchers throughout the social sciences and in some fields within the humanities. He is Distinguished Professor of Communications, College of Communications Scholar and Research Professor of Communications, Sociology and Humanities at the University of Illinois, Urbana-Champaign. He won the Charles Cooley Award from the Society for the Study of Symbolic Interaction in 1988. In 1997 he was awarded the George Herbert Mead Award from the Society for the Study of Symbolic Interaction. She is a Professor in the Department of Educational Administration at Texas A&M University. She has taught at the University of Kansas and Vanderbilt University. She has received numerous awards.